Linux Mint 12 'Lisa' will come with its own customized desktop and it will be based on Gnome 3. The core desktop will be based on a series of Gnome Shell extensions called “MGSE” (Mint Gnome Shell Extensions) that will provide a layer on top of Gnome 3. MGSE also includes additional extensions such as a media player indicator, and multiple enhancements to Gnome 3. 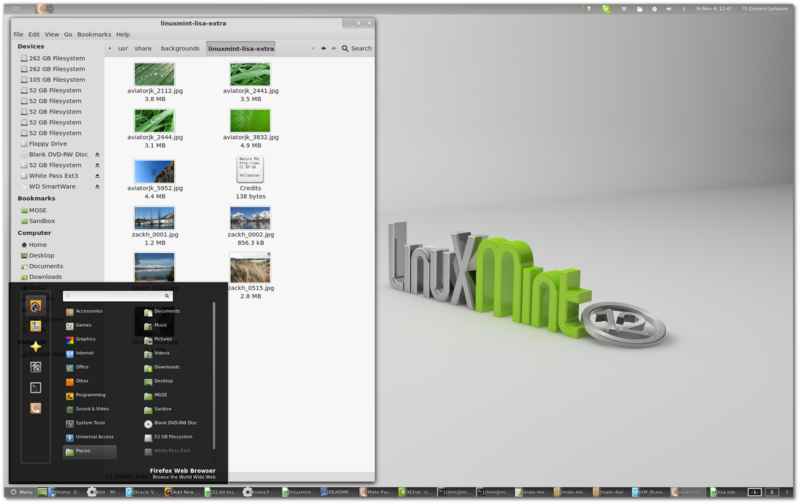 Thus Linux Mint 12 will be more like a hybrid desktop balancing traditional desktop and new modern technologies. Also Gnome 2 fork MATE can also make it to the live Linux Mint DVD if all the remaining integration issues are ironed out in time, thus providing users a side by side experience of both Gnome 2 and Gnome 3. In Linux Mint 11 we made the decision to keep Gnome 2.32. The traditional Gnome desktop, although it’s not actively developed by the Gnome development team anymore, is still by far the most popular desktop within the Linux community. As other distributions adopted new desktops such as Unity and Gnome 3, many users felt alienated and consequently migrated to Linux Mint. We recorded a 40% increase in a single month and we’re now quickly catching up with Ubuntu for the number #1 spot within the Linux desktop market. As much as we’d like to keep Gnome 2.32 a little while longer we need to look forward and embrace new technologies. This doesn’t mean we need to change the way people use their desktops, not at all, it means we need to try and do our best for people to feel at home again, but on top of a brand new base, a new layer of technology, one that is actively supported upstream and that can be maintained properly going forward. From a technological point of view, Gnome 3 is a fantastic desktop, and it’s getting better with every new release. It will take time for Linux Mint to develop a Gnome 3 desktop that is on-par with what we had with Gnome 2, but eventually we’ll be able to do much more with it than was possible with the traditional desktop. Read all at Linux Mint Blog.